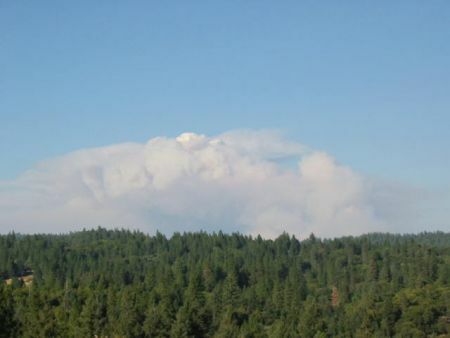 In August and September 2001, we watched from our front deck as the Star Fire burned over a period of nearly three weeks. 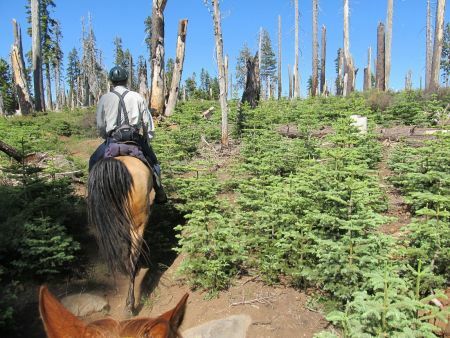 The fire rampaged through thick timber of old growth forest along the steep canyonsides of Red Star Ridge and by the time it was out, 16,800 acres stood blackened. The Star Fire the day it started, from my front deck. Over the ensuing years much restoration has been carried out, including the planting of 4,300 seedlings by volunteers. 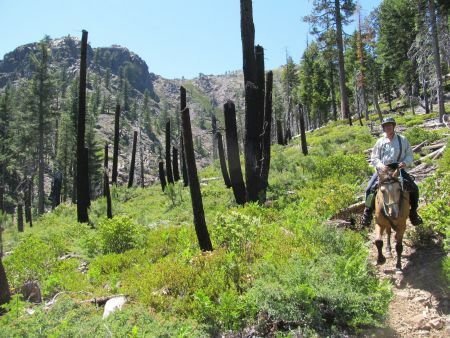 The trail through the area – formerly used by the Tevis 100 Mile Ride until the mid 90s, and still used by the Western States 100 mile Run – was closed for a number of years until the dangerous dead trees could be removed. 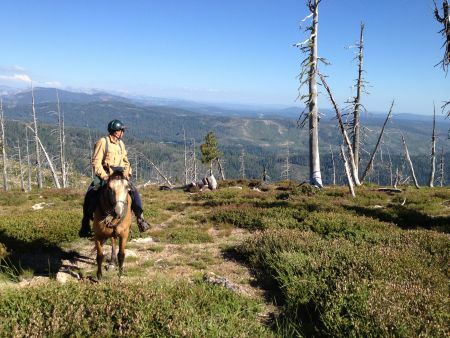 It is now open, once again on the WS100 Run route, and although sparsely used, available to equestrians. Seedlings crowding each other for space along Red Star Ridge. 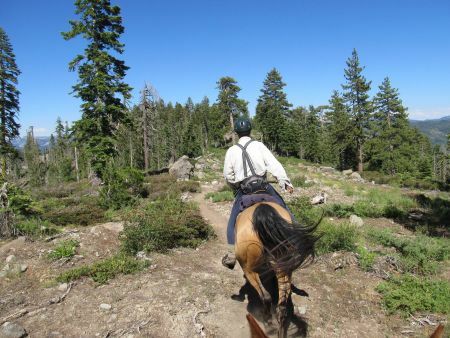 We spent the week and weekend following 4th July horse camping up at Robinson Flat (the 36-mile vet check on the Tevis) and decided to ride the trail used by the Run – Duncan Canyon to Red Star Ridge – returning via the Tevis trail down the dirt Soda Springs Road. On the ridge south of Robinson Flat, looking out towards Red Star Ridge. 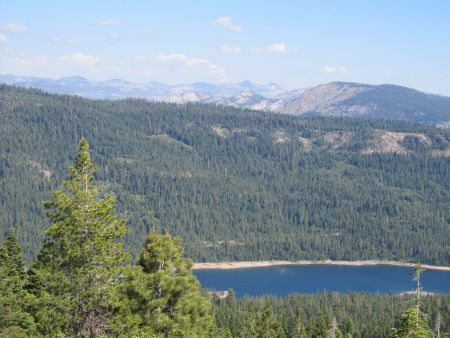 Since the fire cleared the hillside of trees, although you can see Red Star Ridge from Little Bald Mountain on the Robinson Flat side, we weren’t sure what to expect as far as the trail went. The only thing we did know was that the trail would be open and clear because the Run was only two weeks previously. On the way down Duncan Canyon. But one thing we hadn’t considered was: no vegetation = no good footing. Although the views were amazing, the going was slow simply because we were walking through denuded rocks for miles and miles. Looking down on French Meadows Reservoir. Poor Hopi, who’d never gone that far before and certainly wasn’t mentally prepared, was a very sad horse indeed, necessitating lots of stopping to eat “some of that green stuff” to cheer him up. 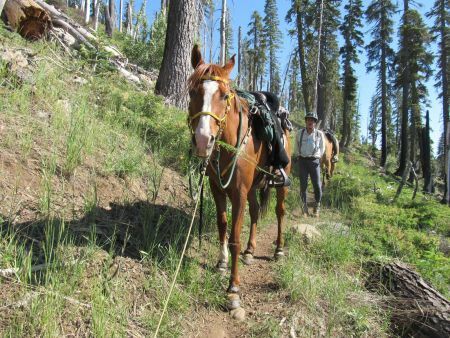 Thankfully, when we finally reached the end of the ridge and picked up the dirt road the 8 miles back to Robinson Flat, he underwent a miraculous recovery and was suddenly able to trot all the way home with much enthusiasm. 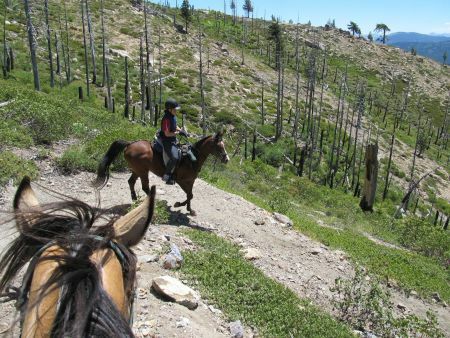 On Red Star Ridge – views in both directions. 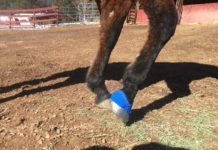 By the time we were done – 23 miles in total – both Fergus and Hopi had each ripped through the toe of a back boot as a testament to just how abrasive the footing had been – particularly some of the more volcanic portions. 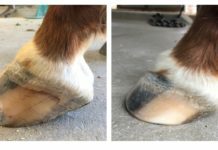 I was glad they had the foot protection the boots offered. 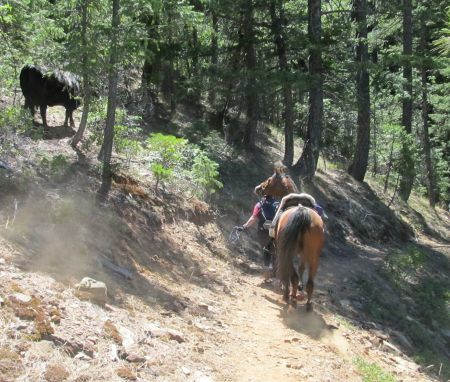 The following day I was joined by fellow Team Easybooters, Tami Rougeau and Renee Robinson, and I borrowed Fergus and we rode “The Canyons” – Robinson Flat to Foresthill. 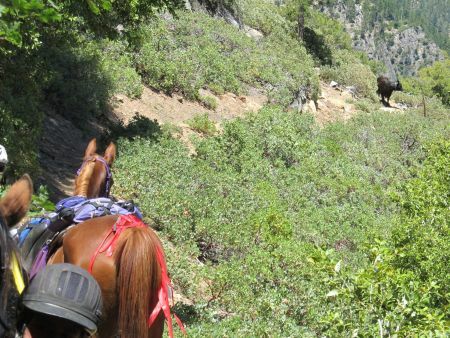 This is a 34-mile trek through the three deepest canyons. Bite stylin’ in his red glue-ons. 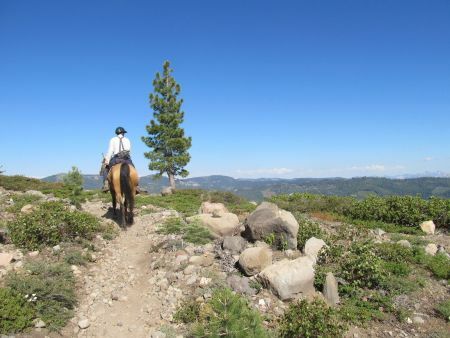 We carefully practised all aspects of the trail, including the rocky singletrack leading south from Robinson Flat, which I found out the next day is being excluded from this year’s Tevis. On the way down the rocky singletrack towards Dusty Corners. Bite is deathly afraid of cows, but look how well he’s keeping it together! 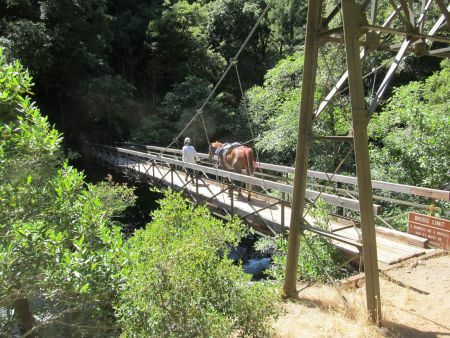 The best part of the whole ride was a wade in the creek below Swinging Bridge, the most gorgeous place on earth. 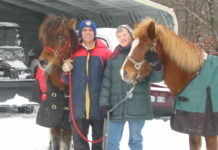 Both Bite and Fancy were in Glue-Ons, while Fergus was wearing Gloves. Despite the thorough soaking, no boots were lost on the long climb up to Devil’s Thumb. 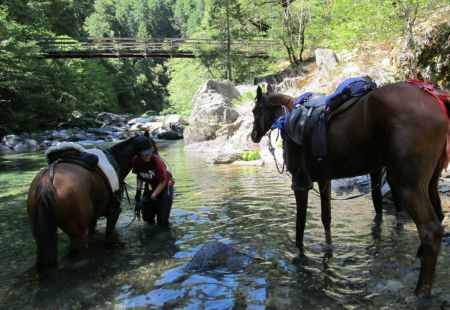 Bite and Fancy enjoying a refreshing wade in the creek after the long descent from Last Chance. Tami and Fancy on Swinging Bridge. 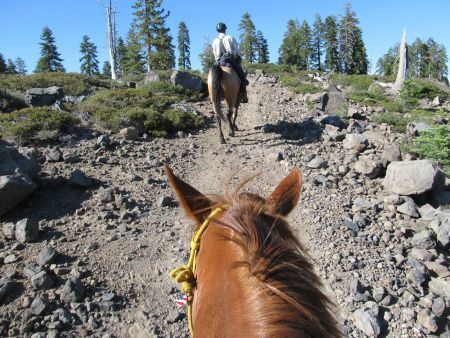 By the time the mini-vacation was over, I’d ridden 70 miles and Fergus had completed a good 70% of the Tevis trail. 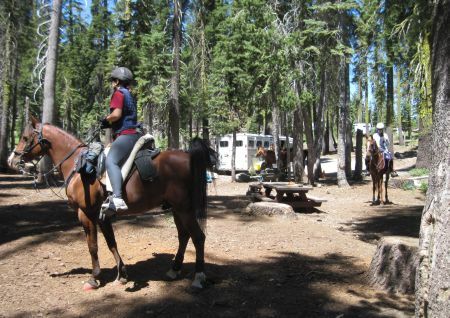 Which got me thinking, and even though I didn’t mean to, I signed us up for Tevis. It should be a most excellent adventure.